How do I add Multiple Bootstrap Carousel Slideshow slider on a single page or one page? In this tutorial, we are providing a sample of working source code. First, download the sample code using the Download Code button at the bottom of the page. Adding and creating multiple bootstrap carousel slider on the page is so easy and simple. So, let’s start with the sample code. After source code downloading complete you will get a zip file “multiple-bootstrap-carousels.zip”. Extract the zip file anywhere into the local computer system. These assets are required to create a bootstrap multiple carousel sliders. CSS directory contains a file “bootstrap.min.css” which is used to design responsive HTML pages. Fonts directory are used by bootstrap CSS to generates the various built graphic icon. Carousel slider arrow navigation control also generated by this. You can check here. 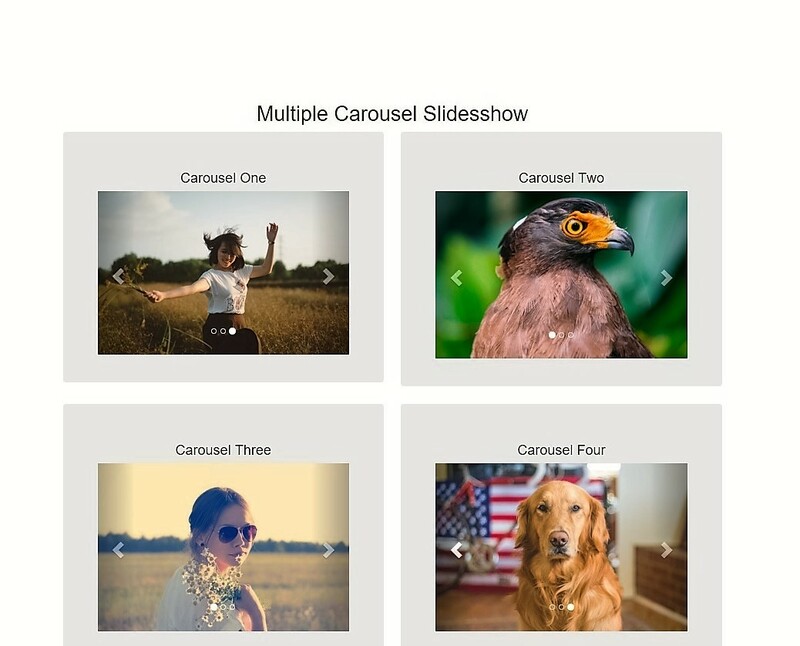 Images directory contains all images which we will use into carousel slider’s slides. HTML file (multiple-bootstrap-carousels.html) is containing all design and code part of multiple carousel sliders. let’s learn more about multiple-bootstrap-carousels.html file. // Pauses slide on mouse enter and resumes on mouseleave. // Whether carousel should cycle continuously or have hard stops. // Whether the carousel should react to keyboard events. In the Body section, we are defining the two carousel HTML code. Now, explaining the working of the first slider code. We have divided a row class div into two columns using col-md-6 class. And into the first column, we added HTML code of first carousel slider same as below. Slider Bullets section it’s build using order list tag of HTML. <ol> uses a class named carousel-indicators, which defined into the bootstrap CSS file. And each <li> tag has a attribute data-target=”#carousel-1″ where #carousel-1 is the same ID we are using in first carousel js code into example code. Slider Image Slides section has a div with a class item. In each, of this div, we have added an image tag to load slide image. Slider Navigation is used to navigate image slides left or right direction. Navigation arrows are created by bootstrap graphic icons called Glyphicon. Navigation buttons are wrapped into anchor <a> tag with bootstrap carousel data attribute function and with carousel-control class. Into <a> tag into href attribute, we have added the same ID ( #carousel-1 ) as we added before into slider bullets part. This ID is used into first carousel slideshow js code to activate the first slider functionality into first slider HTML code. Into our second slider code, we have assigned another ID #carousel-2 for all three parts of slider code like into second slider js code, second slider bullets, and navigation HTML code. Hope! you guys find the tutorial & example code is descriptive and working for you. We have commented on each and every section of code into the example, so you could understand easily each and every code. Thanks to reading, using and supporting this tutorial.